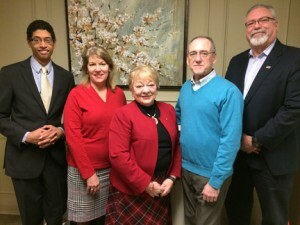 East Providence, RI: United Methodist Elder Care is pleased to announce the appointment of five new trustees: Valerie Perry of East Providence, Susan Thurston of Wakefield, Don Ripley of Smithfield, Jason Preciphs of Rehoboth, MA and Robert Gauthier of Moosup, CT.
Valerie Perry, former East Providence City Clerk and City Councilor, and past Rotary International District Governor and Don Ripley, a Director of Human Resources at Rexel, Inc. had firsthand experience of Winslow Gardens. Both Perry and Ripley had parents who had lived at Winslow Gardens and Linn Health Care Center. New board member, Susan Thurston is the Clerk of Court for the U.S. Bankruptcy Court for the District of Rhode Island. Jason Preciphs practices law with the firm Roberts, Carroll, Feldstein & Peirce. Robert Gauthier is the IT Portfolio Delivery Sr. Manager at CVS.